understand the concept of it. Sure I believed in God, I just never heard him talking to me. Was I supposed to hear him speak? Was it a sound I was going to hear with my ears? Was I going to have a "feeling" about something? How would I know what he was saying and that it was him who said it? I know I have sat and prayed and cried and pleaded and felt nothing. Then I end up thinking why is he not hearing me? Why is he not answering me? It wasn't until I learned to pray it ALL OUT. I mean every last drop of it, till there was no tear left, and no word left to be said. Because until you can get yo that point, you have not left it to God to deal with. Many years and lots of prayer I now know what it feels like to "hear God". I am sure it is probably different for everyone. 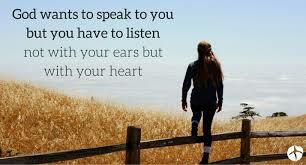 I think God "speaks" to each person in a way he feels they will hear him best. As an example, this past month I have been having a hard time with the idea that it would have been the time I would be celebrating my little angles 1st birthday. Since my little angle went to be with the Lord I did not get to celebrate that. I have not really thought much on it since it happened but this past week I have really been asking why. I wanted to know why God would take my beautiful baby from me? A strong little heart beat just placed inside of me in the wrong position to grow big enough. As much as you love being a mommy here on this Earth, this baby coming to Heave be for you will allow you to be a mommy when you get here too. My heart just sang. I know it may seem silly to most. Even maybe a silly reason to lose a baby but knowing that I will have an eternal baby waiting through those pearly gates for me to snuggle for the rest my eternal life gives me nothing but the greatest joy in the world. My kids are all going to grow up on me and move on with their lives. I'm going to get old myself. But boy oh boy I'll get my chance again to do what I love best! If that doesn't help make me strive to be the best Christian I can be then nothing in this world will. I will hear God and I will continue listening. I hope you will take the time to truly open your hearts and listen to him too.